The Casio Exilim FH25 is a full-featured, mega-zoom camera that is equipped with a set of features that is unmatched by any other consumer camera, but lacks in overall image quality. The features and abilities of your camera out way the fine details within your photographs. 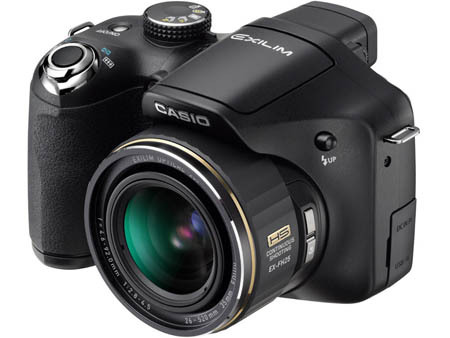 Casio's Exilim EX-FH25 is a high-speed, super-zoom model that is very similar to the EX-FH20. Featuring a High Sensitivity, 10-Megapixel CMOS imaging sensor, 20x optical zoom lens, 40fps burst image capture at 9-Megapixels, up to 1000fps video capture and several Best Shot (BS) modes that have been specially designed to take advantage of these fantastic features, you will be blown away at what the camera is capable of. It also features a slew of Casio's normal BS modes, a 3-inch LCD screen, an EVF, 720p HD movie mode and plenty of in-camera editing features. Since the camera is capable of capturing images so quickly, Casio has designed several shooting modes that capture more than one image in order to combine them, producing a single photo. The camera will snap several pictures in less than 1 second, then combine them to create a much higher quality image. There are specific modes for Night Scene Portraits as well as a High Speed Lightening mode, which allows the user to shoot in very low-light situations without using a flash or a tripod. This super-zoom camera is big for a non-dSLR, which can make it more difficult to carry discretely. Although large, it is very comfortable and easy to hold and operate when using two hands. The camera's controls are well marked and out of the way when shooting. At first it can be a little tricky using all of the camera's special features as the camera's mode dial and BS modes have to be set together in order for some of these features to work correctly. It is not a problem once you learn and get used to what has to be done. The menus themselves are very easy to navigate, allowing you to quickly find and change any of the camera's settings. Performance from the FH25 is very good after the camera has been turned on. The camera takes 4.0 seconds to capture its first image after being turned on. When the camera is pre-focused, the shutter lag is almost instantaneous, firing in less than 1/10 of a second. When allowing the auto-focus to work, the shutter lag is approx. 5/10 of a second. Shooting in 10-megapixel single shot mode, we were able to capture 5 images in 7.7 seconds. When running this test with the flash, we captured 5 images in 10.9 seconds, but the flash did not fire on every other shot. This Casio also features a multitude of burst shooting modes and options. The camera's High Speed burst mode has the ability to shoot 30, 9-megapixel images in just 8/10 of a second! Coming in at 37.5fps this is actually slightly slower than Casio's claims of 40fps. This mode can be adjusted so that the camera will shoot at 40, 30, 15, 10, 5, 3 or 1fps with the option of capturing 30, 20, 10 or 5 shots max, allowing you to create a shooting mode to best suit your needs. Flash continuous works the same way, with options for shooting at 1, 3 or 5fps in groups of 3, 5, 7 or 10 images. Shooting with the flash, the camera was still able to capture images at 4.3fps, again just slightly slower than Casio's claims. All of our tests were completed using a Lexar Pro 2GB SD card, high-capacity Ni-MH rechargeable batteries, BS Auto, ISO auto, flash off and all other settings at the factory defaults unless noted otherwise. All times may vary depending on lighting, camera settings, media, etc. Our outdoor image samples show that the camera does a very good job with exposure and color, and when viewing the image at your monitor's full screen resolution, they look very good. However, when you zoom in to take a look at 100%, you will see that the images are not as sharp as they had seemed. Now you can see noisy areas as well as solid blotches that really take away from the overall detail of the images. Again, I want to mention that what we saw under critical inspection is very unlikely to show up in your prints; even larger ones. Along with the lack of sharpness, you will also see some chromatic aberrations in high contrast areas, which really stand out in the Firehouse shot. Featuring a 20x optical zoom with a 35mm equivalent of 26-520mm, there are very few situations that will come across that you will have difficulty shooting in. The wide 26mm end allows you to capture vast landscapes and large group photography. The only thing that you have to watch out for is the barrel distortion that you will see with the wide end of the zoom. On the opposite end, the 520mm telephoto magnification will allow you to get as close or closer than just about any other consumer camera on the market; you'll be able to get good close-up images of objects that are way off in the distance. Our indoor samples make it much easier to see the blotches and lack of detail in the images when viewing them at 100%. Even when shooting at ISO 100, f/7, there are soft edges, noise throughout and an overall lack of fine detail. By the time you reach ISO 800 your image is almost completely unusable due to the high amounts of noise and lack of detail. Assisting you in your low-light shooting is the pop-up flash unit, with a range of up to 23ft. at ISO auto. This allows for the camera to use much lower ISO settings and faster shutter speeds while shooting in low-light, allowing you to capture crisp, sharp images. The camera controls the flash very well, providing an excellent exposure even when shooting macro shots. We did see a lot of red-eye from the flash in most of our portrait shots. With the camera's face detection software, portraits are easy to take and come out very well. The focus and exposure are automatically adjusted when a face is found within the frame. Skin tones and colors look very realistic, while the red-eye is a bit distracting. Our night shot samples compare the quality of the new Lightening shooting mode versus an image taken using the Program shooting mode with automatic settings. When viewing the images at 100%, it is very easy to see that the Program mode image has considerably more noise, while requiring the use of a tripod. The Lightening Scene mode gives you slightly darker image, but with less noise and can be taken hand held. Video can be captured on the FH25 in two different ways. You can capture standard video with sound at standard 480p and 720p resolutions (30fps). These movies produce good exposure and color with little compression noise. The playback is fairly smooth and easy to watch. The camera's built-in mic is very sensitive and will pick up all sounds that are around the camera. The second way that you can capture video with the camera is via the high-speed or high frame rate modes. These modes capture video only (no sound), and play back at 30fps, giving you a smooth, slow-motion video. As the frame rate increases, the resolution decreases as does the quality of the video. With frame rates as high 1000fps, these are some of the fastest on the market for consumer cameras, which are faster than the human eye. As you watch these videos and see the flashing in the background, you are actually seeing the lights flicker, causing the different colors. Be careful with the length of your high speed movies, since just a couple seconds of action could take several minutes to play back. Supplying power to the FH25 are 4, standard AA sized batteries. During our tests, we used Energizer 2500mAh, NiMH rechargeable batteries that allowed us to capture 1,125 images and videos. Approx. 700 of these images were taken using the camera's High Speed burst mode. Comparing this to Casio's estimate of 490 shots, this is very close if you count the burst groups as a single shot. Seeing as how the camera uses AA sized batteries, there should be no problems finding extras, if you should run out. Bottom Line - The Casio Exilim EX-FH25 comes equipped with a set of features that you will struggle to find on any other camera. With the high-speed shooting options, incredible versatility of the 20x optical zoom lens and slew of pre-programmed shooting modes, this camera is capable of doing anything that any other consumer camera can do. With less than perfect image quality, you will have to decide what is more important to you, the features or the image quality. With a MSRP of US $449.99, there are several other mega-zoom cameras with similar sets of features available that you may also want to consider: Canon PowerShot SX20 IS, Olympus SP-590 UZ or the Panasonic Lumix FZ28, all for $450 or less.